The history of Nonni’s Biscotti begins in the little town of Lucca, Italy, in the heart of Tuscany. There, among meandering cobblestone lanes and venerable piazzas, one particular Nonni (an endearing term for Grandma) made biscotti for her family and friends. When Nonni moved to America almost a century ago, she continued baking the family biscotti to acclaim. One day, her children decided to take the recipe to the bank, creating the Nonni’s brand—now the number one brand of biscotti in the U.S. In the modern manifestation of the American Dream, the company was sold to a private equity investment firm several years ago. 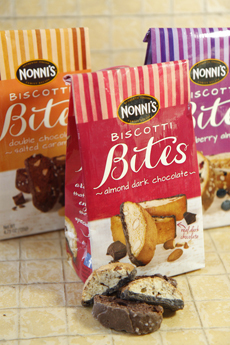 Nonni’s ThinAddictives, a melba toast-thin alternative to dense biscotti, introduced last year. Biscotti Bites, smaller size biscotti. In Tuscany these biscotti are called cantucci di Prato—cantucci (con-TOO-chee) for short. They were originally baked with almonds from the plentiful almond groves of Prato, a town in Tuscany. A cantuccio (plural: cantucci) is a hard almond biscuit. The name cantucci means “little stones,” the stones referring to the almonds. 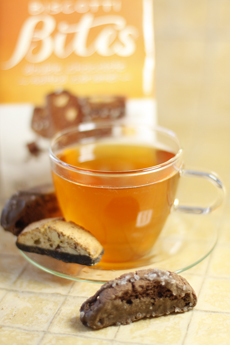 We are very keen on the Biscotti Bites, and appreciate that the smaller size gives us a great biscotti experience with fewer carbs. Each is a two-bite treat; the suggested serving size, five pieces, is 120 calories. But two or three pieces is more than enough, and one can suffice. Almond Dark Chocolate Biscotti Bites, an almond biscotti with the bottom edge dipped in dark chocolate. Classic deliciousness! Double Chocolate Salted Caramel Biscotti Bites, our favorite, a chocolate biscotto with a chocolate dip; bits of salted caramel are mixed into the dough. Very Berry Almond Biscotti Bites combines dried cranberries and almonds; it is dipped in a vanilla yogurt coating. As a chocolate fondue dipper: Dip into a shallow pot or bowl of chocolate fondue (you can’t easily spear the biscotti on a long fondue fork). As dessert bruschetta, spreading the tops of the biscotti with mascarpone. The Italian dessert tradition of dipping biscotti and a glass of vin santo—a sweet late-harvest wine—doesn’t really work here. Plain biscotti are typically dipped into the wine, which softens the biscotto and adds the sweetness of the wine. Biscotti Bites are too short to dip, and the chocolate or yogurt coating kind of interferes with the honey notes of the wine. But the work-around is: Don’t try to dip; sip and bite, alternatively. The shiny, perky bags are just waiting for you to make someone happy. Bring to a friend’s house, to teachers, to hairdressers and anyone who deserves some tasty crunch. Our new favorite snack with tea or coffee. Photo by Elvira Kalviste | THE NIBBLE. The line is certified kosher (dairy) by United States K.